Arrived back in Halifax early last evening, dumped everything in the apartment and headed straight to the walk-in clinic. I was able to secure a visit for a couple of hours later. Came home, had some soup, then returned to see the doctor. 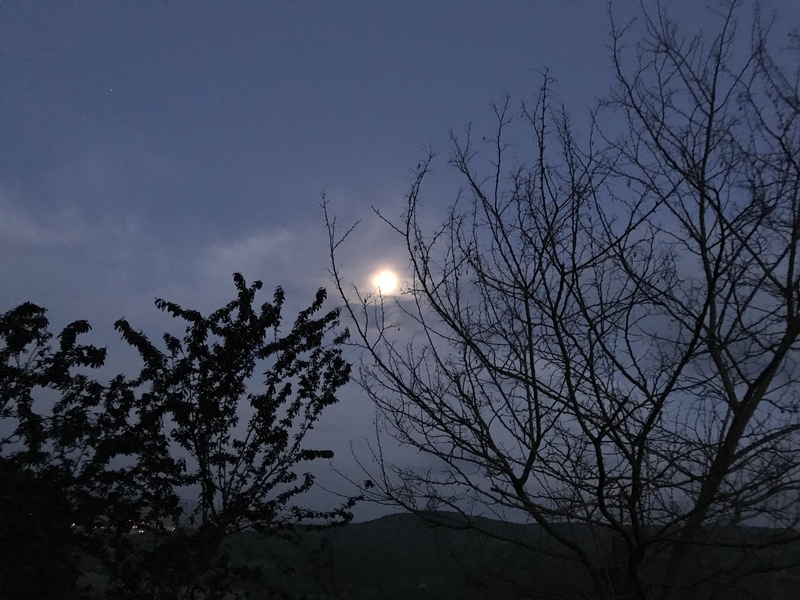 No pneumonia, no other serious communicable diseases – just a very over-reacting reactive airway due to the many irritants encountered in Italy. The doctor prescribed a 5-day course of prednisone (an oral steroid tablet) to see if that will help reduce the swelling in my bronchi; we’ll see if it does. I started taking it this morning. In the meantime I’m continuing with the pulmicort I’ve been using for the last six weeks (I’ve used it off and on for 27 years). Coughed continuously this morning but I think I’m starting to feel the steroid kicking in (about 5 hours after taking the first dose) – the congestion deep in my chest is rattling less so the uncontrollable coughing is subsiding. I unpacked this morning, put stuff away – I find putting stuff back much easier than preparing to go away. I’ve done several loads of laundry much of which is hanging to dry. 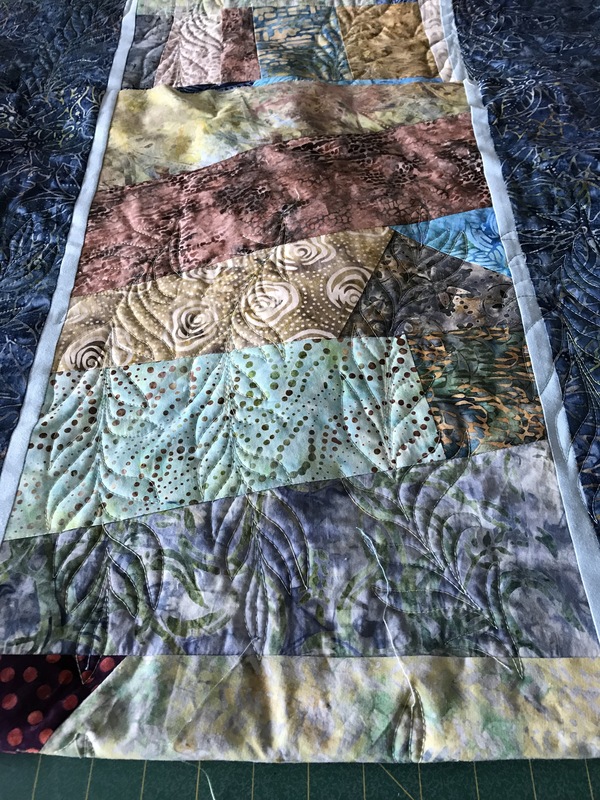 I’m not feeling up to it today, but tomorrow I plan to return to the partially quilted quilt I had on the go when I departed. This, after all, is a blog about my creative endeavours – the knitting, sewing quilting, etc. that I do. I need to get to work again – I have a showing of small textile wall art pieces already in my collection in June, and a larger exhibition of quilts end of July – beginning of August (I’ve got six new quilts completed and will fill in with two from the quilt stash) and new wall art (which I haven’t even begun to work on). 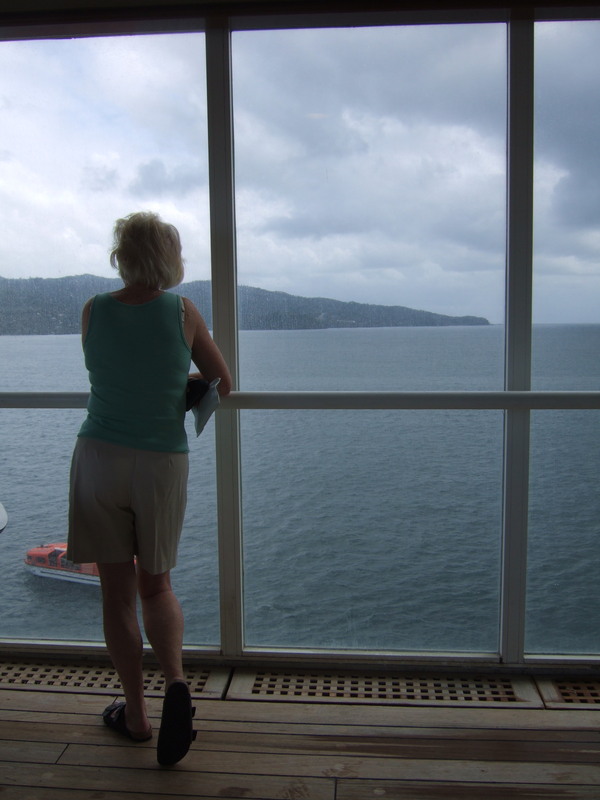 This photo of the women on the ship deck is one I want to do – removing the lifeboat and putting her on the other side – she will also need to be lightened and sharpened – I worked on that a bit before I left for Italy. 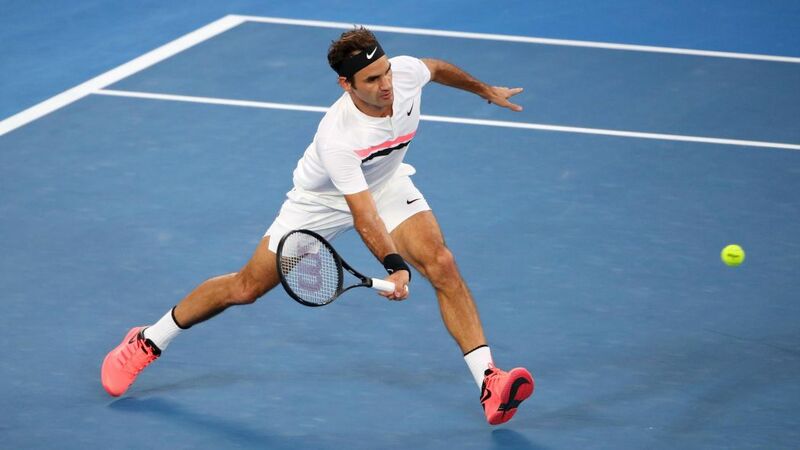 A second work I want to create is of Roger Federer playing at the Aussie Open 2018 – this closeup was taken from the overhead spider cam but shows him practically in the air – both feet are a fraction off the court surface and you can see him tracking the ball. 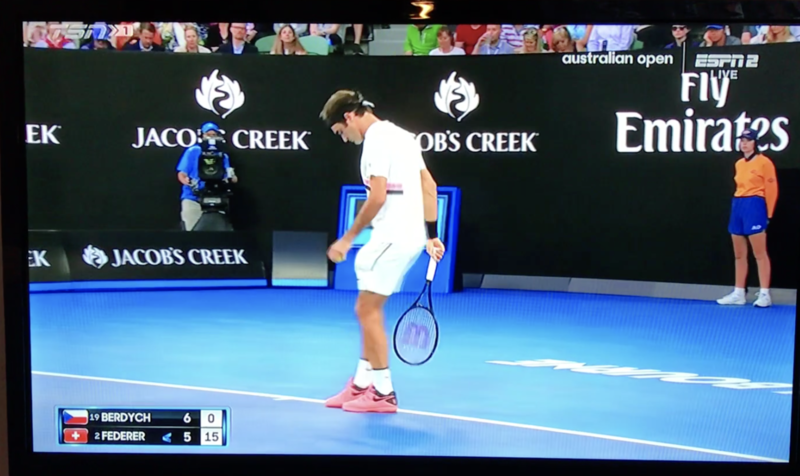 My intention is to have the figure smaller in relation to the court by filling in the background as in the image below – with the timer clock (obscured by Federer in this image) and probably cutting out the spectators. This one needs more playing around but I want to get going on it soon. So finish quilt and work on these two art pieces – full steam ahead. 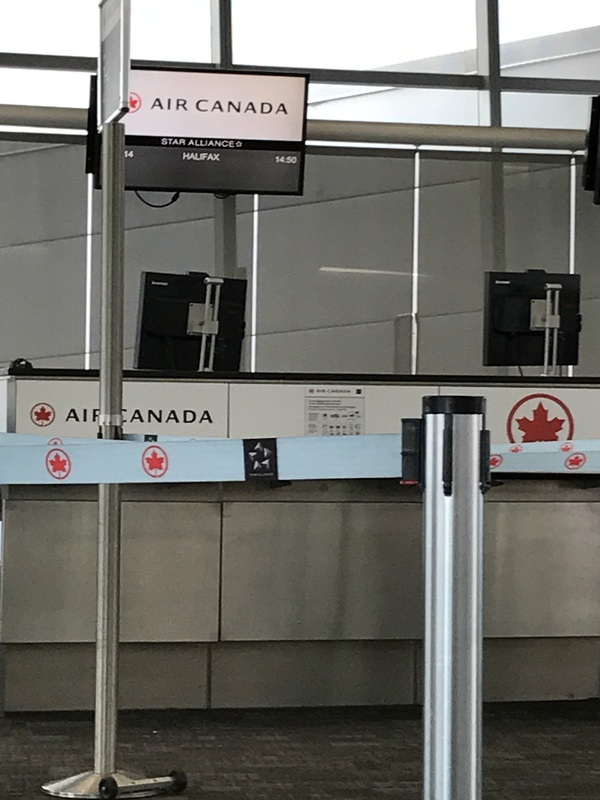 I’m sitting in the Toronto airport waiting for a connecting flight home to Halifax in about 2 hours, three days sooner than planned. What I haven’t mentioned was that I travelled with my “mystery” cough hoping the change in climate and location might actually reduce the tightness and congestion. 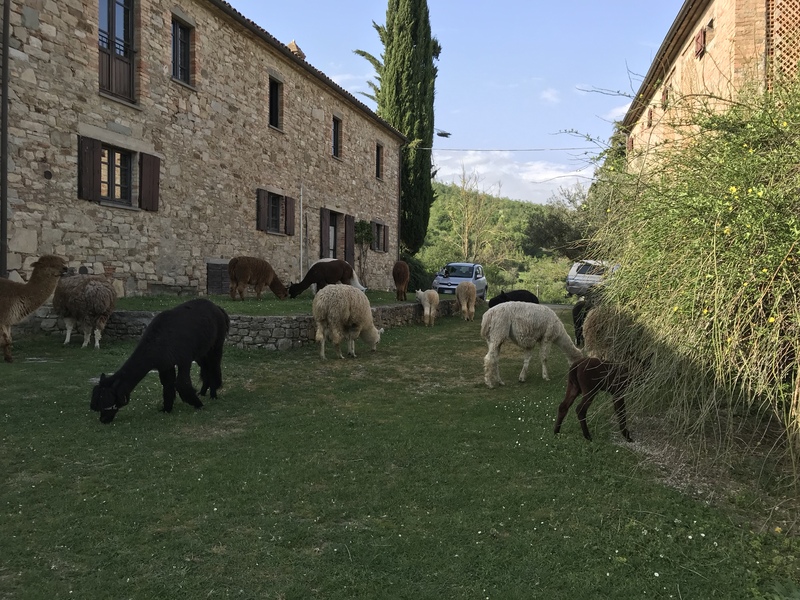 In fact the reverse happened – I reacted to the alpaca, lots of vegetation was in bloom so lots of pollen, the old house, formerly a barn for animals and hay made the cough slowly worse. I woke up Tuesday morning (yesterday) and said to Linda I thought it prudent to get back home as quickly as I could. This morning I departed Florence at 6:40am to Frankfurt, connected to Toronto and am now waiting to fly the last leg of the journey shortly. I’m not sick, but the chest congestion and the coughing are dreadful. My usual maintenance rituals aren’t working so it’ll be off to the doctor tomorrow to see what’s possible to settle my airway down. I was afraid to stay till Saturday concerned the situation would deteriorate to the point that I couldn’t travel. Figured it a good idea to get home while I was able. 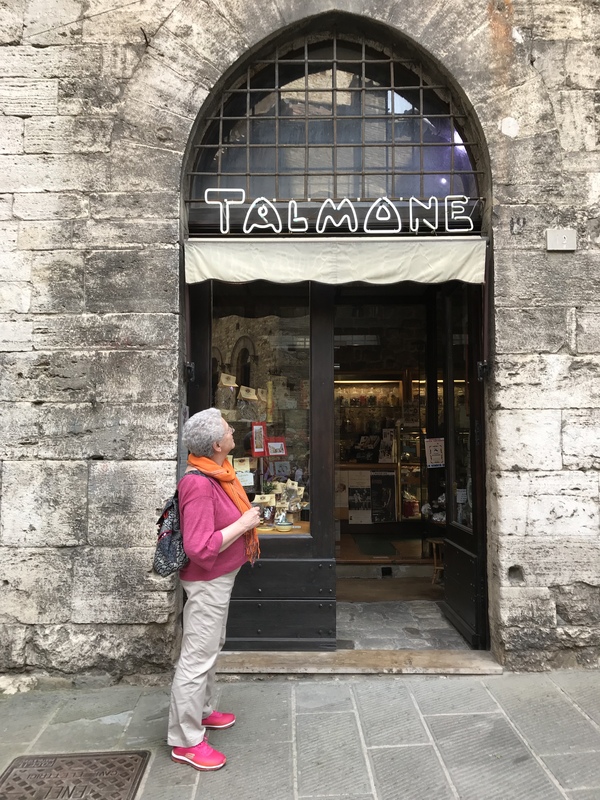 I had a great time for the 10 days I was in Tuscany/Umbria. Loved all the shmoozing and eating we did. And that’s more than you wanted to know! 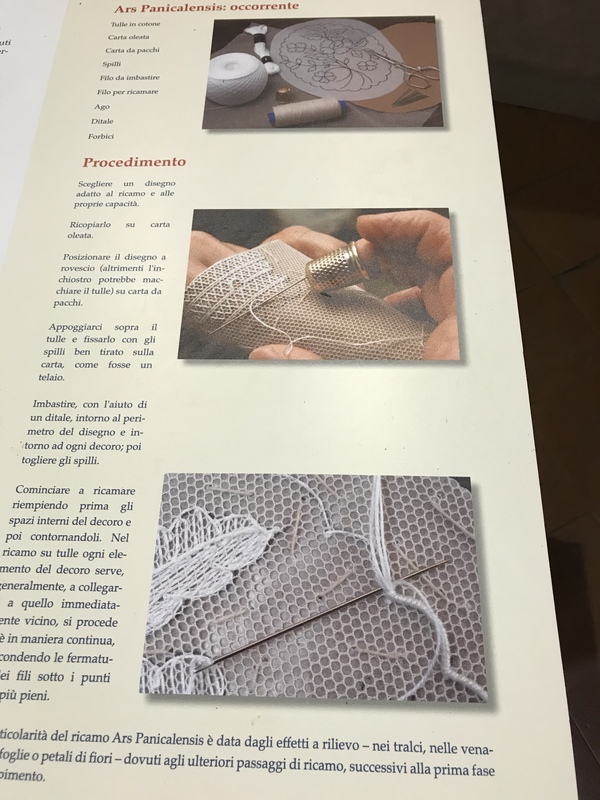 Today’s highlight was our visits to Tuomo and Panicale to see two very different sorts of lace. 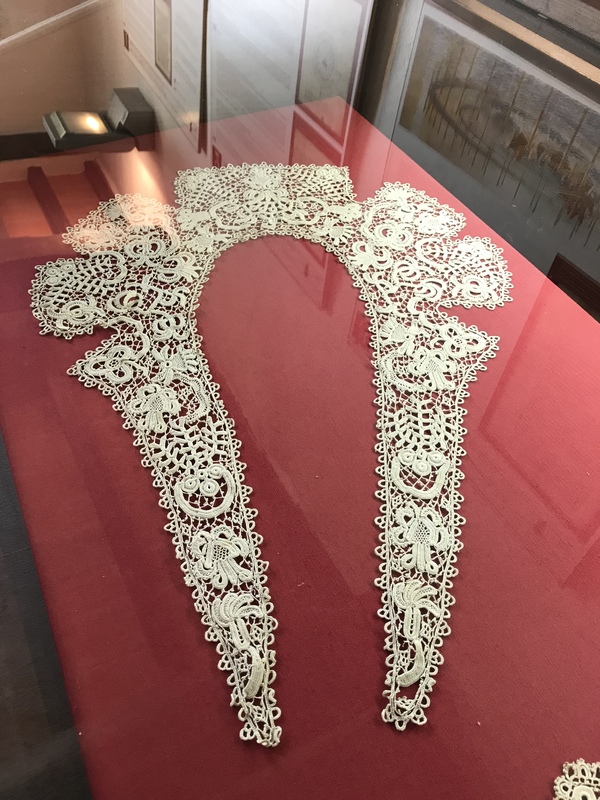 Unfortunately we didn’t get to see any of the (mostly elderly) women at work but we did get to meet one crochet lace maker and I was able to buy two small pieces which I intent to frame. The hand work is simply magnificent – done with extremely fine crochet cotton and very fine steel hook. My maternal grandmother and her sister Rose both did crochet, but their work was not nearly so fine or elaborate. I crochet, too, but I’ve never tried such intricate work. I looked at it for quite a while. 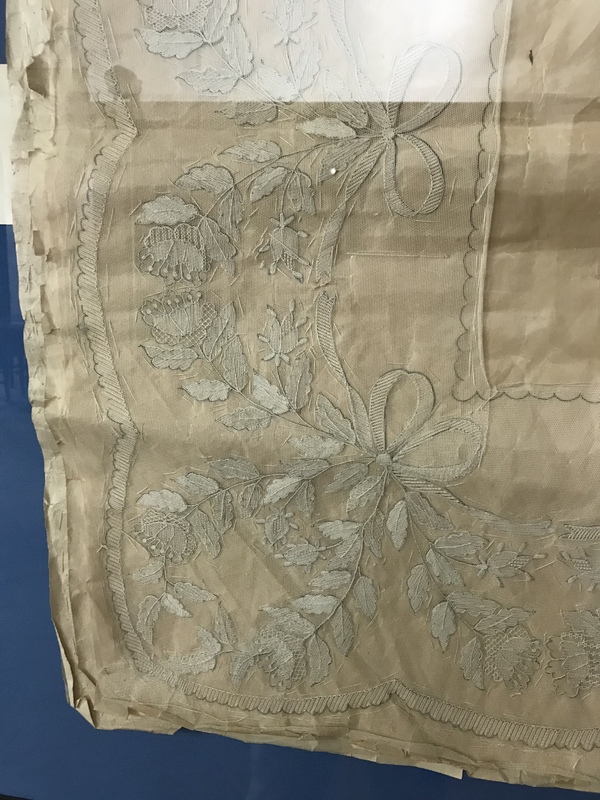 The second type of lace is sewn with needle and fine thread through tulle. My maternal grandmother and her sister Rose both did beautiful crochet work but with a much heavier thread. I, too, crochet well but usually with wool. 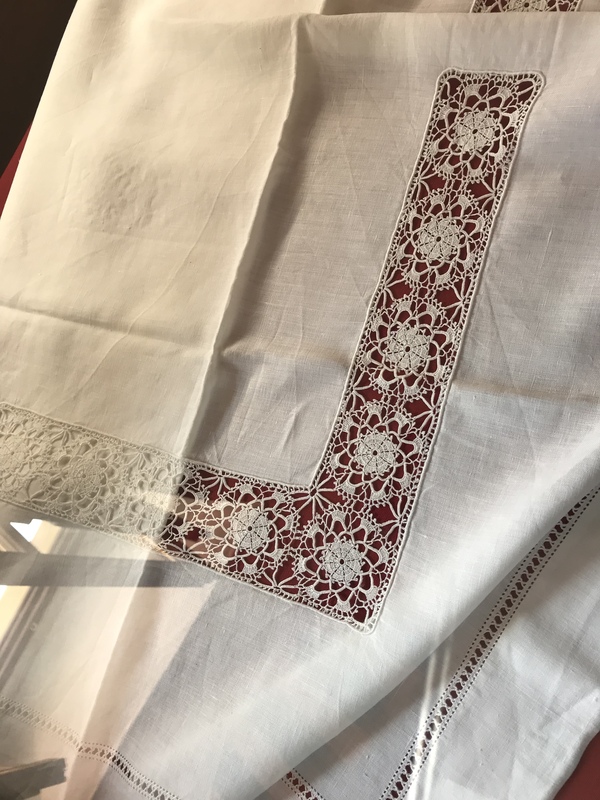 I will have to try some fine cotton to see if I can manage something this delicate – I imagine it could take years of practice! I’ll promised myself I would eat sensibly today so while the others ordered full course meals, I ate some of the antipasto, and ordered a salad. I tasted the meat and fish meals – a forkful but that was it. The food, again, was delicious. Even with the meagre lunch I ate my evening meal consisted of half a pear. I could face no more food. 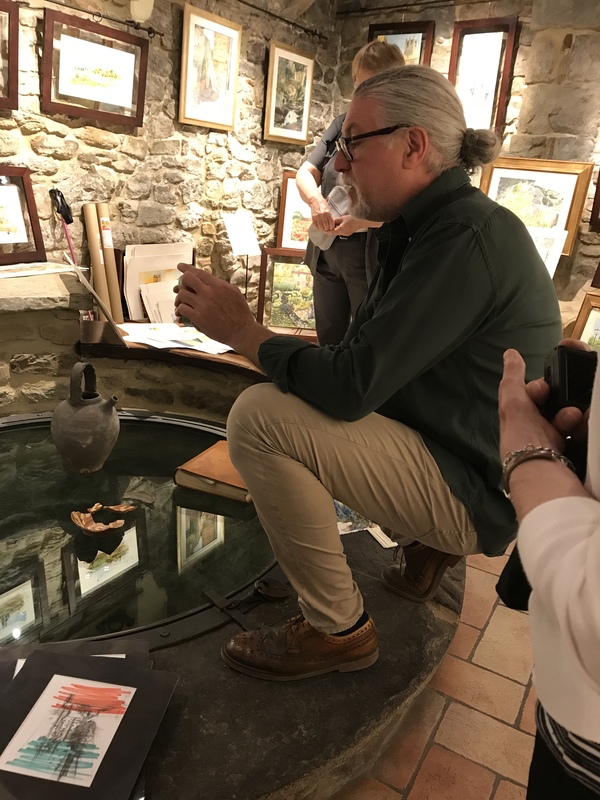 Sunday – we visited nearby Citta Di Castello – three attractions. 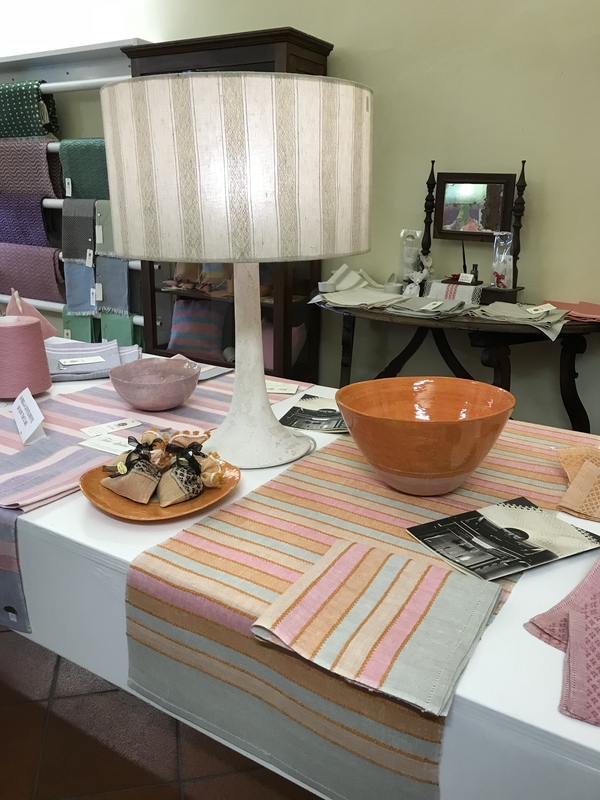 First we spent time at the linen museum and workshop where they display old linen artifacts of the region as well as manufacture goods for sale using the ancient looms. The linen goods are quite fine and beautifully made even if they limit themselves to a few old regional patterns. 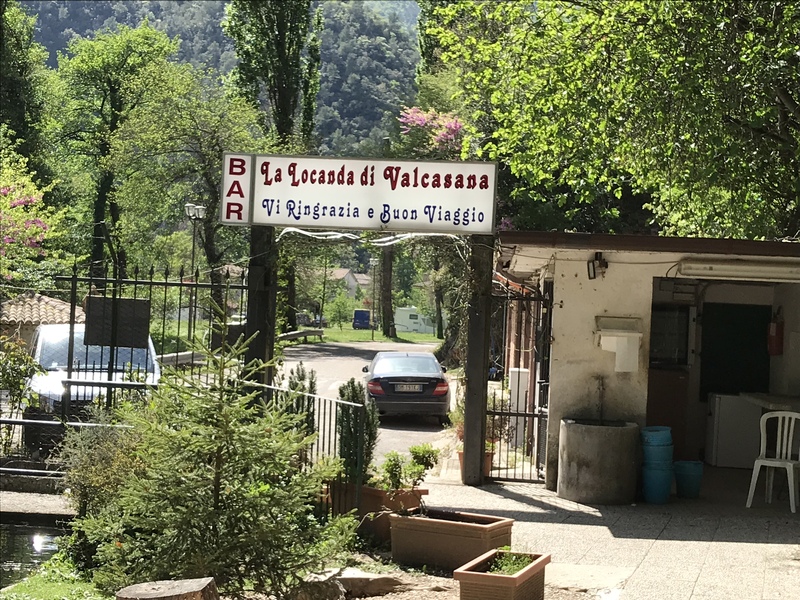 The private Museum is also the home of one of the first Montessori Casa dei Bambini – the school was set up to allow the women employed in the workshop to provide safely for their little children while they worked. A few of the early Montessori materials were on display – some geometric sets and alphabet cards. I need an aside here. I’m sitting on the front patio back at the alpaca farm watching the lawn being mowed by the animals. The alpaca are totally ignoring me. Finally Marissa comes, opens the gate to the path to the road below and shoos them away and they cooperate. They are now grazing below. Today, also, the wine festival was being held in the main square. 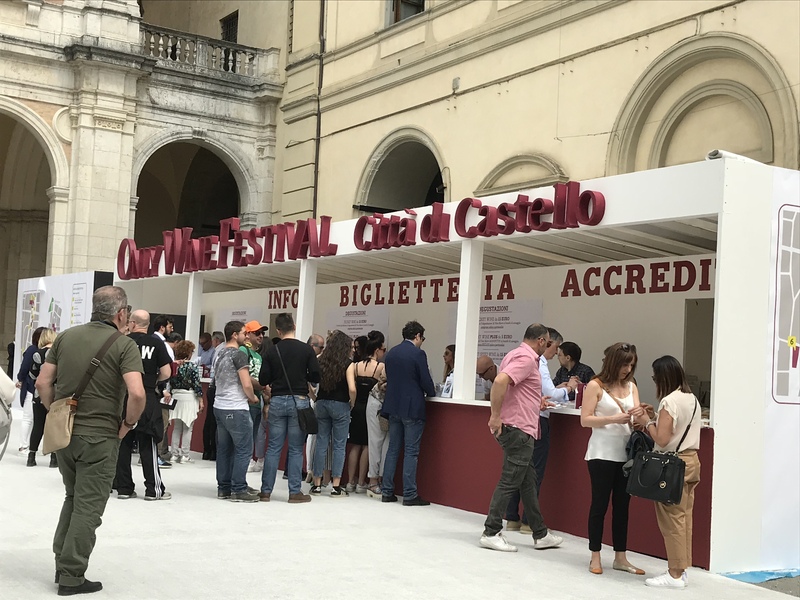 We stayed long enough to take a few photos and people watch – a lot of people leisurely sampling the wines on display. Clearly a popular regional event. Next we visited the Burri museum. This very large, windowless building houses many art pieces from huge steel sculptures to his black on black minimalist modern wall art to many small graphics in the lower floor galleries. I spent a long time observing the subtle changes from left to right as the work changes from ochre to black. 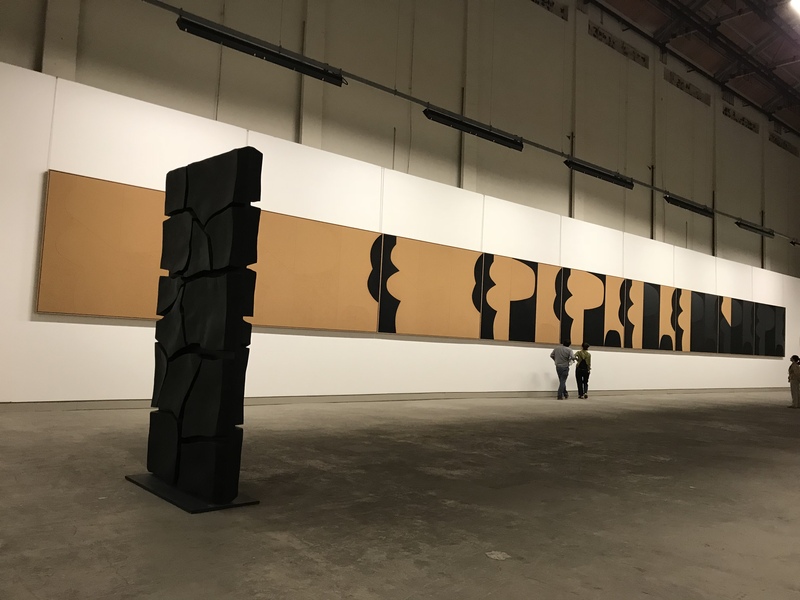 Many of Burri’s works are constructed of vertical panels – I could see none where the panels were aligned horizontally one above another. I’m assuming the panels were a consequence of the width of the materials he was using although I didn’t find that mentioned anywhere. I was also struck, particularly in the black on black works, by the complete lack of reflected light of some of the matte black paint. All very interesting to experience. And then of course we stopped at an out of the way country restaurant for Sunday lunch. Antipasto, primo, secondo, and dolci. We ordered so we could share in every dish on the menu today. 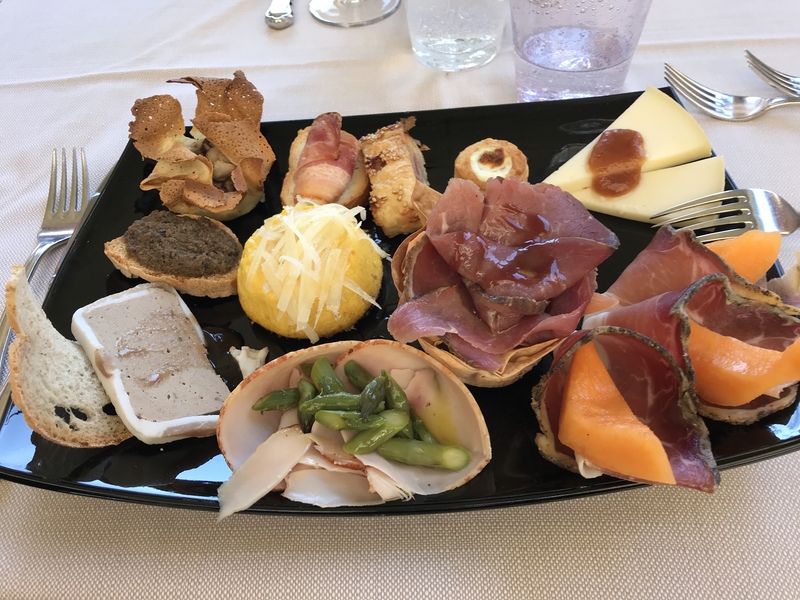 The food was simple and scrumptious: three different procciuti with cheese and fresh bread, asparagus crepes, lasagna, spinach ravioli in tomato sauce, followed by a grilled pork trio, grilled beef, and roasted chicken in a lemon sauce with roasted potatoes, cooked spinach and roasted fennel. For dessert we had creme brûlée, a chocolate something, and biscotti with vin sancto. All wonderful. We finished lunch at a quarter to four. Rolled home and to nap! More surprises tomorrow – but less eating for me. We spent today visiting Perugia – the capital city of Umbria. Lots of people but it seems the visitors are predominantly Italian. Saturday, today, was also the antique market so it was very busy particularly in the top level of the city. But let me backtrack. We arrived, parked at the central bus station, met Marco our guide and began our exploration upward. Perugia is a many layered city – Perugini liken it to a wedding cake, each layer perched atop the previous one. 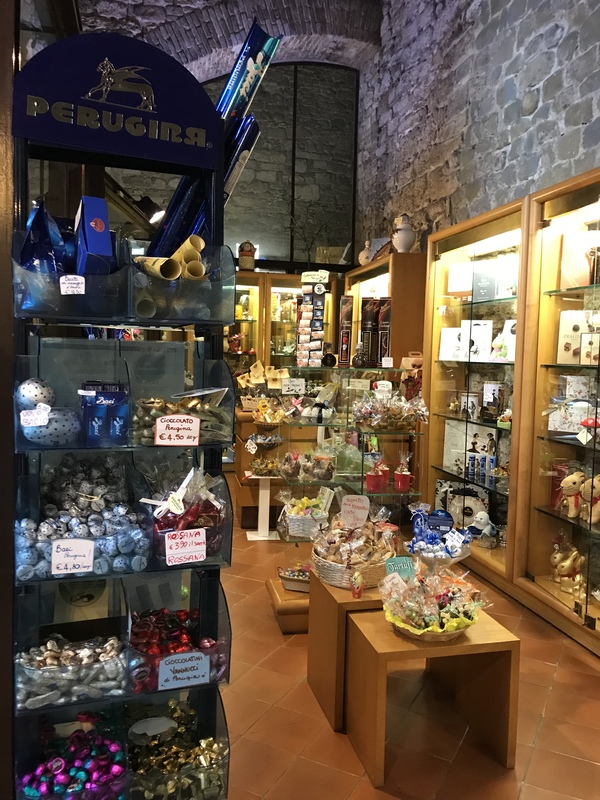 We began by taking a couple of underground escalators upward and inside the Rocca Paolina – a fortress structure the foundations of which were built by the Etruscans, added to during medieval times, built and rebuilt repeatedly – even today construction is ongoing to convert some of the interior spaces into shops and markets. The history of this place is very visible in the construction elements – Etruscan stones large, square without any mortar; medieval building blocks smaller, less regular, Renaissance more brick-like. Originally the main “street” was open above but when the city was taken over by the Papal States in the 12-13 hundreds the Pope decreed previous construction be demolished and the street was enclosed. Perugia remained under the rule of the Papacy until the formation of the Italian a state in the mid 1800s. At that point symbols of Papal power were torn down and new civic buildings were erected. Each successive city incorporated the construction of earlier ones both as economical but also as a way of showing subjugation of previous rule. 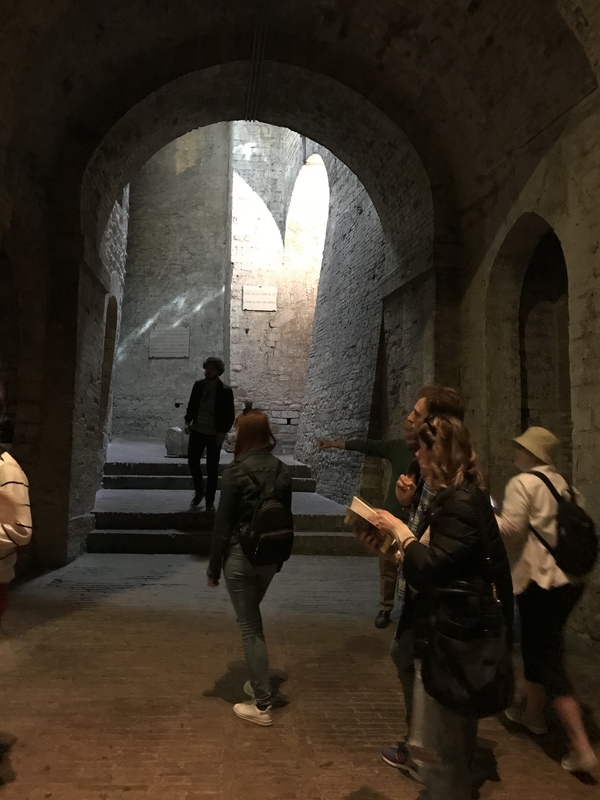 To really see and understand the history of Perugia would take several visits and lots of poking around! 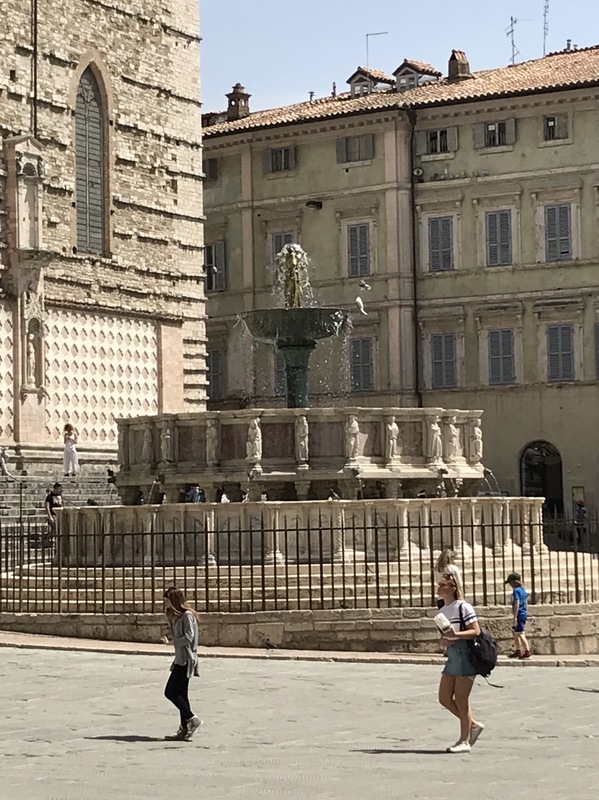 We ended our visit with Marco at the fountain in the upper Piazza which separates the Cathedral and the civic building showing the conflicting forces which shapes the life of Perugia. 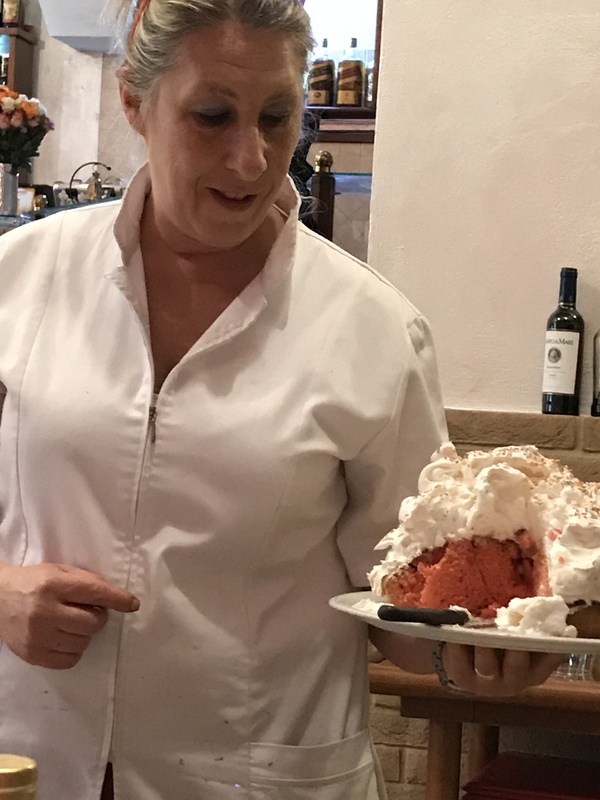 It was now time to eat something but on our way for lunch at Da Peppone – a pizzaria – we stopped at the chocolate shop recommended by Marco (not for the tourists – for Perugini). We actually sampled it, but it wasn’t what we expected. It turned out to be a dry cake iced with meringue – looked much better than it was. Our last stop of the day was to a museum/workshop dedicated to the preservation of the old weaving patterns. Today there are very few hand loom weavers. The work we saw this afternoon was amazing. Marta Brozetti really does wonderful work that preserves the old techniques. She does try passing on what she knows but it’s quite likely her work is a dying art. This was our view as we sat on the front patio enjoying a light evening meal. The alpaca and sheep were in for the night, the birds had settled, and we were sipping wine and enjoying ourselves. 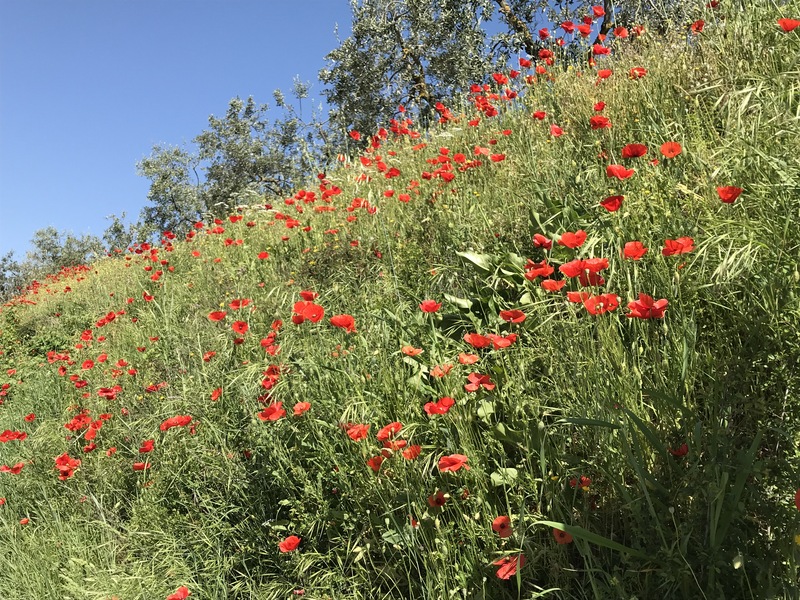 Right now the countryside of Tuscany and Umbria is ablaze with poppies – not planted but growing wild everywhere. This morning we had a chance to make a brief stop to photograph them. They glow in the morning sunlight – whole fields of them. I have no idea how long they last or whether they’re harvested or not but they sure are lovely. 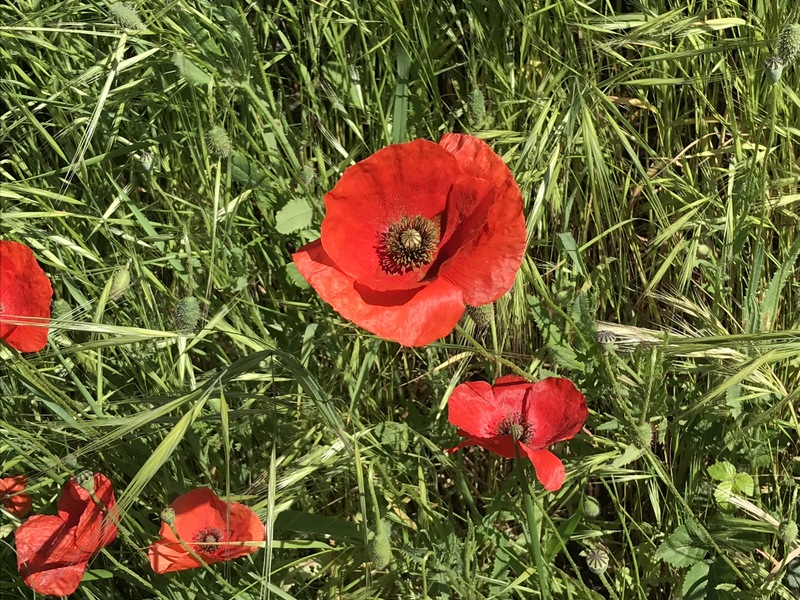 We saw the poppies on our way through windy mountain roads to Cortona, nearby in Tuscany. 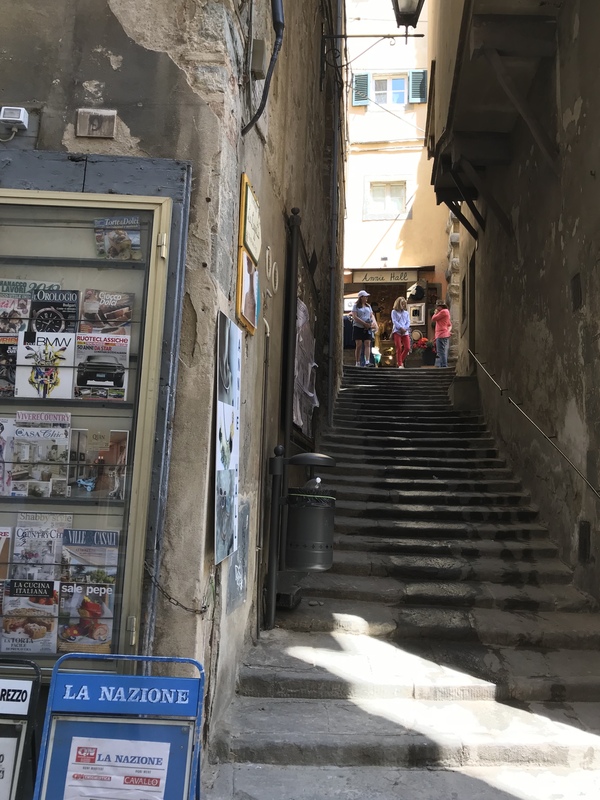 Cortona is situated part way up a steep slope, a tiring city to get around because except for one rather flat street, the streets need serious climbing. Our first stop was Il Pozzo – owned by Ivan (never got his last name) a wonderful Italian charmer. He’s an historian, an archeologist, an art aficionado. The shop has a superb collection of art, photographs, old maps, hand made paper. 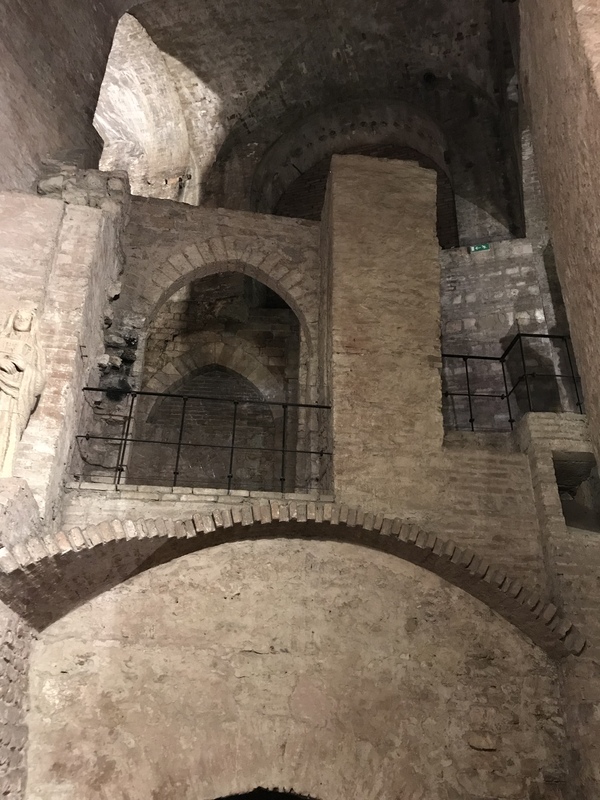 Ivan gave us the history of the building – it’s foundation is Etruscan, then medieval building sits on top, followed by more recent construction on top of that. When he bought the building 18 years ago he had no idea what he would uncover as he began clearing away the accumulated debris. At the center of the main floor is an old Etruscan well! The well is about 10-12 feet deep – a water depth of 5-6 feet, the surface 5-6 feet below the glass covered opening. 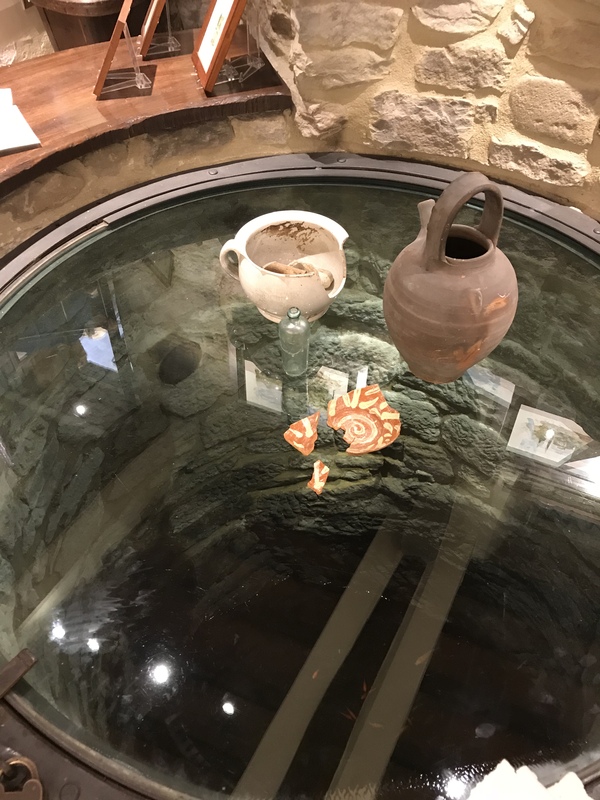 The well had been used as a dump for centuries and in excavating the mud Ivan came across artifacts originating from Roman times, as well as bits of medieval pottery. Currently he keeps carp in the water which sits atop many feet of unexcavated debris. Following our visit to Il Fozzo, we climbed a street from the Piazza to have lunch in a nearby restaurant. Another delicious meal. I ordered what I thought would be a small antipasto, this is what arrived, all delectable. I managed to eat about a third of the offering. What we’re disovering is just how much Italians eat. We finished lunch at about 2:30. We then drove uphill to the Sanctuario Di Santa Margherita – a large church on the outskirts of Cortona. The inside of the cathedral was lavish and the views of the surrounding countryside spectacular. 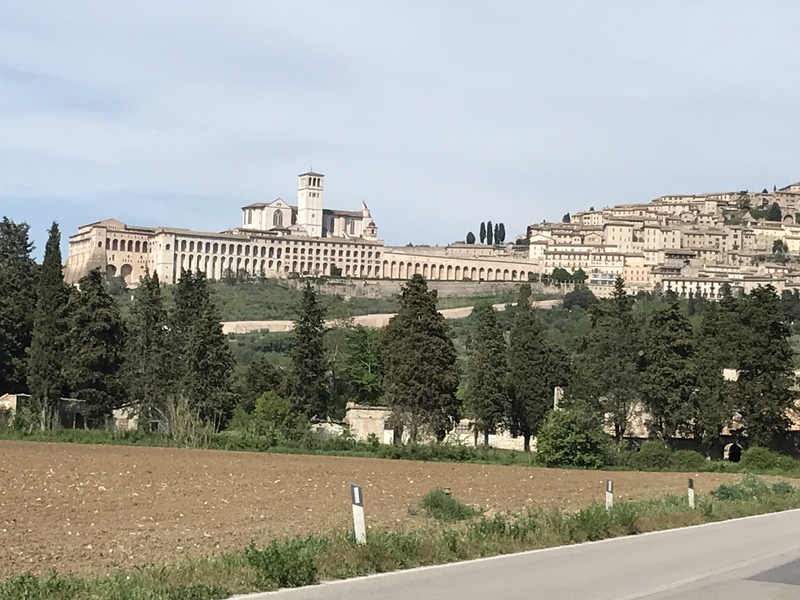 On our way home we made a brief stop at a monastery nestled in a corner of a large olive grove – one of the last stopping places of St. Francis of Assisi, the rather large well kept buildings now house just 5 Franciscan monks. I slept most of the way home – it’s all that food midday that does me in. We’ve just finished a light dinner of sautéed chicken breast with salad. It’s now time to call it a day. Another adventure tomorrow. We have had a grand day. We visited the Hemp Museum near Spello. 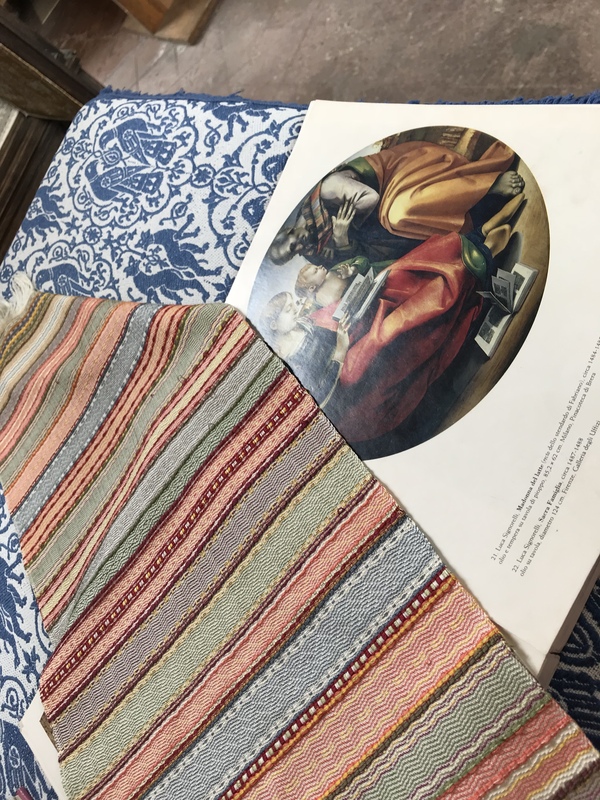 The mission of the Museum is to revive interest in and skills associated with the originally thriving hemp production in Umbria. More about that later. The outstanding event of our day was lunch. 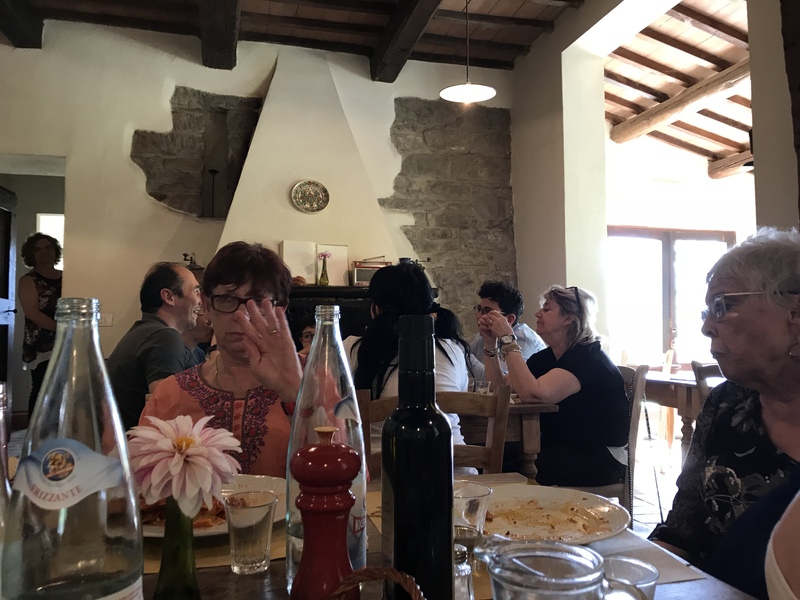 We originally stopped at a restaurant in an old monestery to have lunch but the restaurateur had no food and no chef because of the holiday yesterday. He suggested we go to another place not far from where we were. 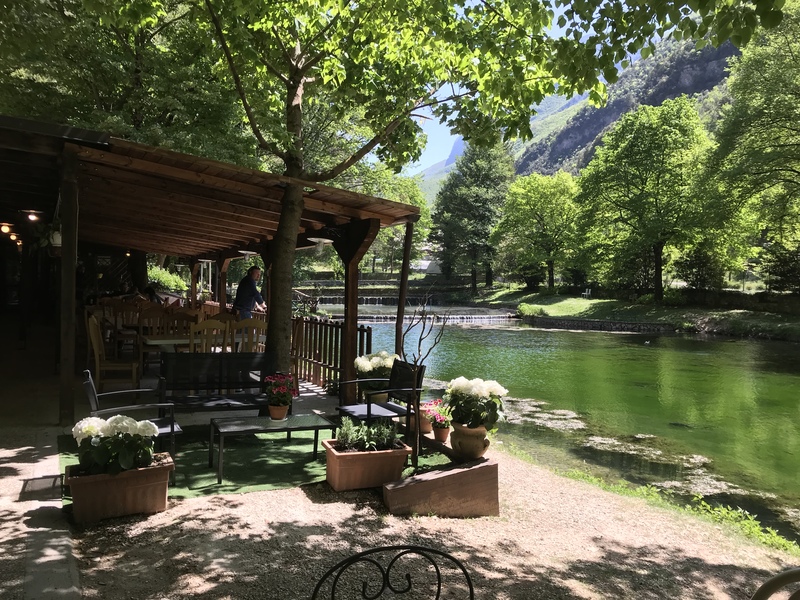 It took a bit of hunting to find La Laconda di Valacasana – located on this pond filled with trout. The house specialties: trout and truffles (this being the truffle region of Umbria). 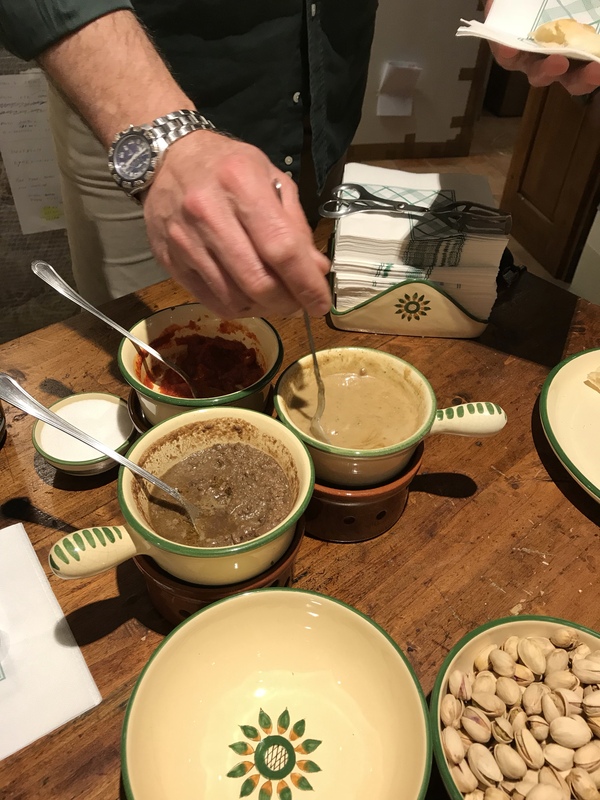 The meal began with appetizers provided by the house: first two plates of various prosciuttos and pecorino cheese with truffle, trout, and creamed truffle bruschetta, then two more plates each with three different truffle samplers. Next a bowl of some kind of thick bean soup, then a liver dish with some kind of vegetable, and one more that I can’t now recall! Then the waiter asks what we want to eat. 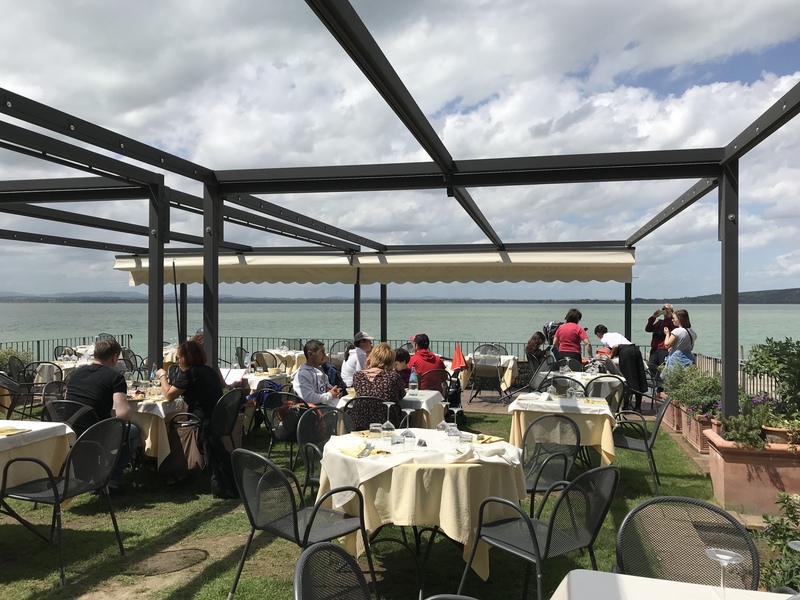 We ordered: trout with truffle (x2), tortellini with creamed truffle sauce, polenta with truffle (and other ingredients), spaghetti with a truffle sauce, mixed salad and spinach with parmesan and garlic which we shared around. 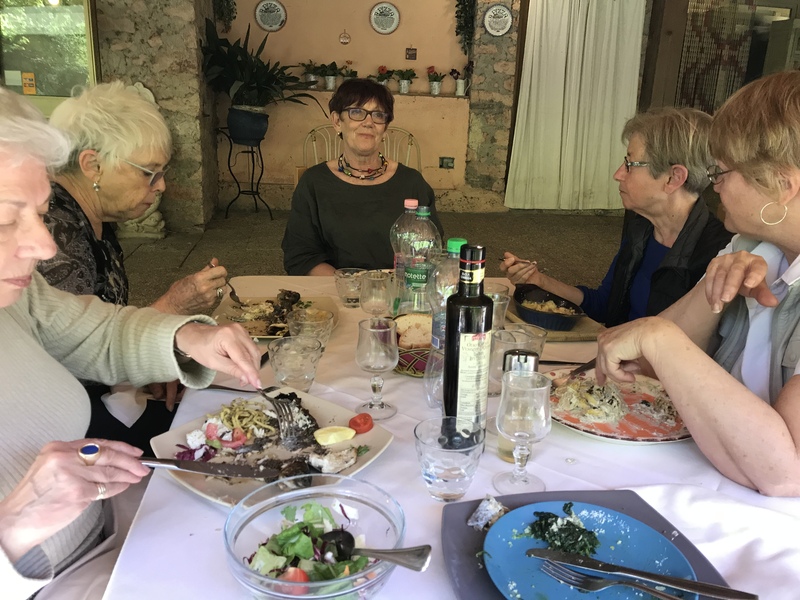 We ate until we were all stuffed, then slowly pushed away from the table to head on to Assisi to view the Duomo. The entire meal for six, with many bottles of water and carafes of wine – €100! Back to the hemp museum. 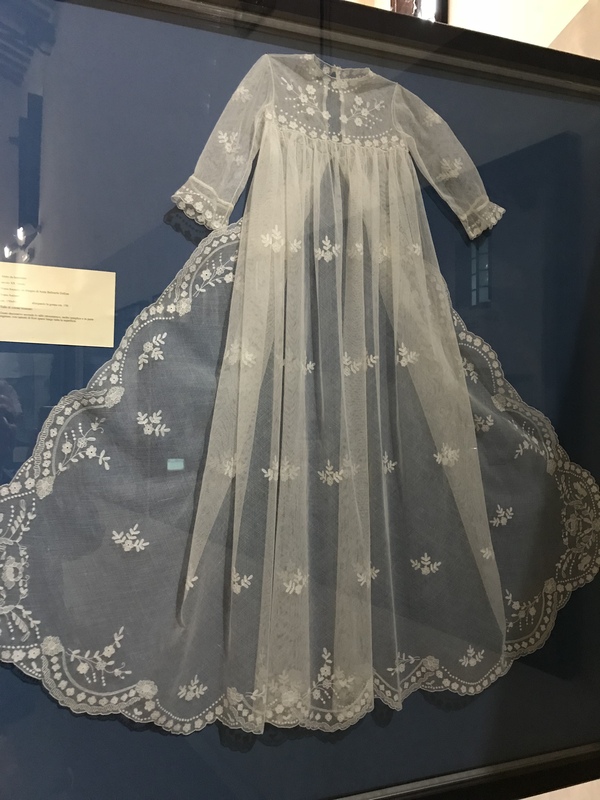 The museum houses a collection of old linen, cotton, and hemp garment and other artifacts beautifully preserved and housed in drawers with details of age and donors displayed. Beautiful hand work. 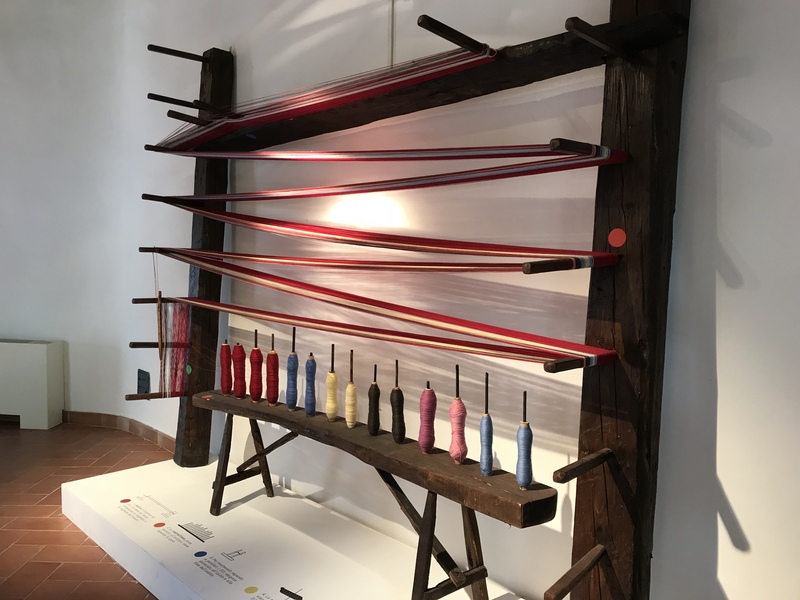 There are small looms for people to try their hand at weaving, a large loom on display. A lovely young woman, a fashion student, walked us through the collection with explanations in English. Because lunch had done me in (we didn’t finish till 3:30), I abstained from the steep climb to the church and instead accompanied Linda to do some grocery shopping. The small supermarket wasn’t busy so the staff were happy to provide an informal language lesson – it’s a surprise how vocabulary and phrases are coming back after 50 years. We’re now sitting on one of the patios with wine and more food (if you can believe it), enjoying the end of the day. Looking forward to whatever is on the agenda for tomorrow.